Beautiful day again but perhaps not the best day for fishing. You will have to find some shaded parts of the river. Another hot and sunny day and the river is running at a nice height. Looks like a day for looking for shade or in the fast runs as we are in for a hot, bright one. River is still spot on. Three day summer, woo who! The weather is overcast with some light rain at the moment and the river conditions are still spot on. The river conditions are still good but the weather is not ideal, because it is wet and quite breezy. The Eden has dropped to it's normal level and the weather is dry and overcast. No further rain and the river's dropping back to a more normal level. Just the wall to wall sunshine to contend with again. Never satisfied are we!!! 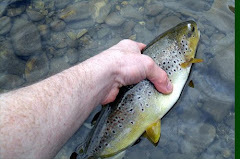 A couple of hours yesterday found the river in good condition (and a couple of fish). It's a bit higher than normal for this time of year and with a tinge of colour. The potential problem for today is the brightness. Another dry day yesterday. The river should be just about right and the weather's currently overcast with almost no wind. With less rain yesterday the river should be starting to get back to a fishable level. The upper reaches could still be the best bet though. More rain, more water in the river. Bessybeck could be your best bet!!!! The river is likely to be unchanged from yesterday and it's currently adding more rain to the system. As usual, the upper reaches offer the best chance unless you're into worm drowning!! With more rain yesterday and overnight, the river is likely to be unchanged from yesterday. The upper reaches offer your best chance. With last nights rain and more falling now, the river is likely to rising. If you really must fish try the upper stretches to give yourself a fighting chance. These two websites may help in the planning of your days fishing. The first is http://www.xcweather.co.uk/ , this gives wind direction and strength and is updated every 15 mins . The next is http://www.metoffice.gov.uk/ which has a rainfall radar updated every 30 mins. To find the rainfall radar click on latest/recent on the right hand side of the page and the it should come up with the rainfall radar option. I think, if not just keep looking. 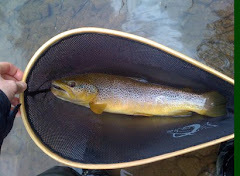 The river conditions are still good and the weather is good at the moment. 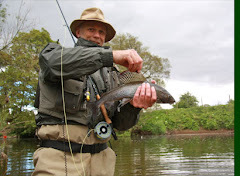 The river is at a good fishable level and the weather is dry and sunny. The Eden is running spot on but it is quite windy and there is a fair chunk of rain coming our way according to the met office. Its up to you !! The Eden is still running at a good level and the weather is overcast and dry at the moment. It's a bright sunny morning with a nice breeze, the Eden has dropped considerably and although still a tad high, it's at quite a good level. Make the most of it!! The Eden is clearing and dropping but it may still be a bit higher downstream in the Musgrave/Warcop areas. At the min the weather is dry and overcast and quite nice !! The Eden has started dropping and clearing but is still running quite high and there is more rain falling at the min, so i think it may rise again at some point. The Eden is still up following yesterdays rain and is unfishable with a fly. At the moment it's not raining but don't hold your breath. The Eden is still running above normal and would be difficult for fly fishing but you may find areas upstream that are fishable. The weather is dry and overcast but more rain is forecast. Overnight rain has brought the river up again, leaving it mainly unfishable with a fly. You may find areas that are fishable but it will be difficult. 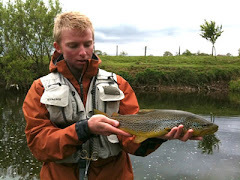 The Eden is running slightly above normal and could be difficult conditions downstream of the main tribs but fishable . The river is running at a nice height and the weather is overcast, breezy and dry but it looks like rain is on the way.